Dub … Dub plates … Dubstep … What the Dub? So, I asked Pete “what the dub” where did this genre come from? Where and when did “Dub” start? The Dub music sound came to prominence in the early 1970’s in Jamaica. It started when recording artists such as Dennis Alcapone would record instrumental tracks for the B side of their singles which other performers would add their own vocals to. These instrumental versions morphed into dub by addition of effects and echo and other studio trickery. One of first credits for this was King Tubby who owned his own studios in Kingston, Jamaica. This then became a sound that his protégé, Lee Scratch Perry would go on to record many tunes and introduce to a wider market. 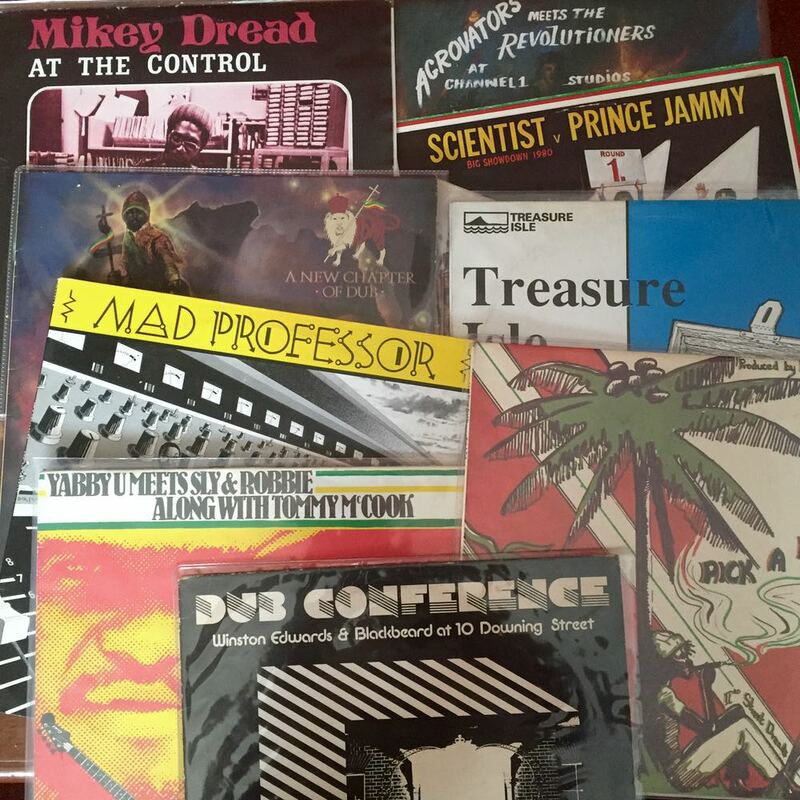 Other producers making records at this time in the genre include Scientist and Mikey Dread. A more up to date name associated with the genre is Adrian Sherwood with his On-u-Sound label. In 1970 the Jamaican music scene was dominated by Sound Systems which were a form of disco held in hall or outside yards. There were many of these which were in competition with each other. In order to be the best and get the most people in to them, they would create their own music/mixes unique to the Sound System. To do this they would take a popular tune of the moment and add effects to make their own version. These would then be cut on to a 10″ acetate disc which would only be played at their events. These dub plates, made by people like King Tubby and Coxsone Dodd became a popular ground for competition amongst the Sound Systems. A couple of years ago Pete was very excited to find a collection of these dub plates – about 40-50 of them. All of them, by their very nature is unique and the tunes are not available anywhere else. We recorded and uploaded them to YouTube so that reggae and dub fans around the world could now hear them. This dub style became very popular in Jamaica as it became its own genre. Complete albums were made which were mainly instrumental and stood alone as a form of music. Towards the end of the 1970’s the sound was picked up by white audiences and bought over to Europe. In the late 1970’s and early 1980’s 12″ disco singles often had dub mix versions of the songs on the B side. Later on digi-dub emerged where computer electronics was used on tracks. Purists frown on this twist in the genre but dance and music change with the audience and the bass heavy sound has been coupled with fast bpm drum tracks. This sound has morphed into drum/bass & dubstep which are still very popular genres today. If you are selling your Reggae or Dub collection then please contact us. We will come to you and pay cash for the right collections. We buy in Birmingham, West Midlands, Warwickshire and Staffordshire and will travel UK wide for the right collections. If you have a record collection to sell then fill out this form. Tell us a bit about what you have there.